The Open Stage takes place at Catonsville Presbyterian Church, not 2nd Presbyterian Church in Baltimore. Catonsville Presbyterian Church is located just outside the beltway 695 at exit 13, MD-144/Frederick Road. Open Stage evenings are set in a very informal atmosphere with an appreciative audience. 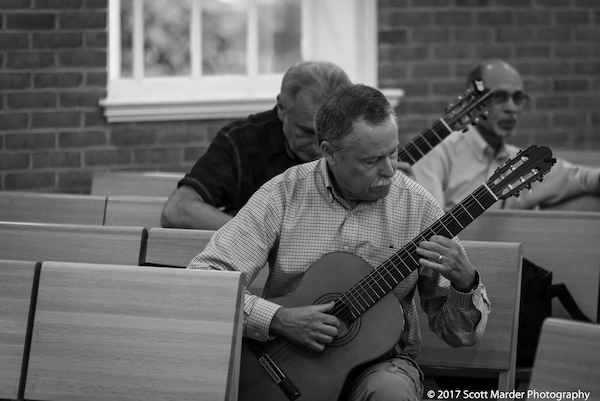 All levels of classical guitar playing are welcome – players, listeners, ensembles, guitar with other instruments, whatever! You are welcome to bring your guitar to play, or you can just listen to others. While all are welcome, performers in particular are encouraged to become BCGS member(s). The Open Stage evenings give players and listeners a chance to meet other members and the BCGS Board members. The Board is more than happy to answer any questions on the BCGS activities, such as upcoming concerts, outreach programs, and volunteer opportunities with the BCGS. This is a perfect opportunity for beginners to play elementary pieces in front of an audience, as well as for more experienced players to just have fun sharing their music. YOU ARE NEVER READY TO PLAY, SO JUST COME AND DO IT!